I'm marching toward getting the hull prepped for a primer coat and there are a ton of little details that have to be taken care of before I get there. The big thing is spot filling and fairing any anomalies that will look bad once painted if I don't deal with them. Ideally, when the hull is finished I hope to have a pretty clean looking hull with no cloth print through and no tape 'bulges' along the seams. All of this makes for plenty of idle time because each batch of epoxy I make up takes a good day to be ready for sanding. It takes 15 minutes to apply and then you wait. I've gone through several rounds now and I think I'm pretty close to being able to do the fill coat, which should take care of the cloth weave that is currently on the hull. After that, there will be more spots that I missed and I'm considering applying a 'scratch' coat to the hull before actually priming. Bonded, filleted, and taped, but pre-fairing compound. A scratch coat is basically a throw away coat of paint that you apply to the hull to make a uniform color and will help highlight any imperfections. I'm not sure if this is a real term, but I'm making it one now and whatever it's called, I know that I'm not the only one who uses it. The problem with spotting imperfections now is that the hull color is so mottled it is hard to actually see the surface texture. I'll get a can of grey spray paint once the fill coat is done and throw it on to see what I've missed. I have been trying to make the most of my idle time though and took care of a few things that needed to be done. The first was to fit and mount the skeg. 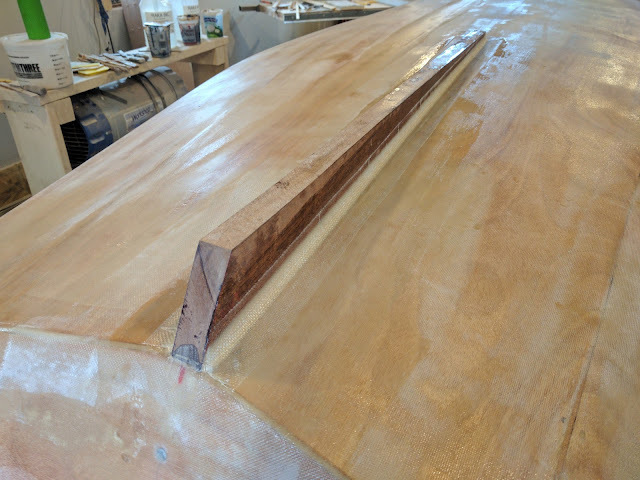 I had some nice 5/4 Honduras mahogany stock that I cut down to size by scribing the hull curve on and trimming to the transom angle. This was a four step process where I initially epoxied it in place, then waited till that kicked (not full cure), then filleted a ~10 mm radius along either side. I left that until it was still a bit green but no longer sticky and applied a layer of 50 mm tape on the filleted sides. Finally, I waited until that was cured enough to sand and knocked off the woven edges of the tape before applying a layer of fairing compound. I still have to radius the edges at some point, but that will be just before paint. The second item I knocked off the list was to clean up the bottom of the outwales. These had a combination of drips, glops, and edges of the sheathing cloth from previous work on the hull. They always seem to catch all the gunk that drops and then I forget to clean them up when they are still wet, making more work for me. This took way longer that I thought and used a combination of a heat gun and sandpaper to get all the crap off. Tedious is the word for this job. 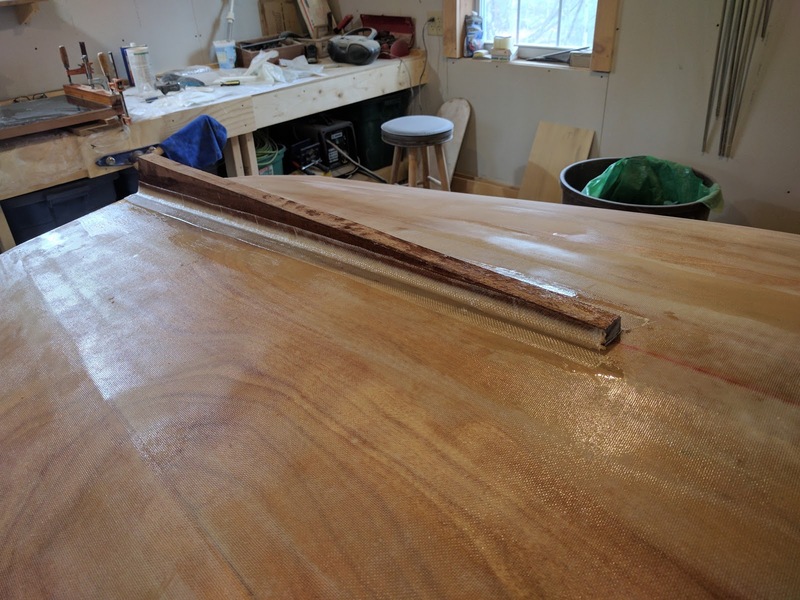 I finished up by running a small fillet along the hull intersection and filling any imperfections between the edge of the cloth and the outwale.